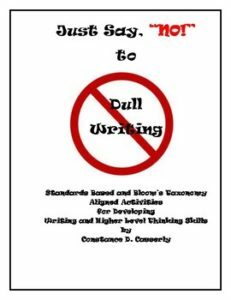 This year-long,”Just Say, ‘NO!’ to Dull Writing” activity has always been one of my star middle and high school lesson plans. On the first day of school, I handed out to my students right after we reviewed the syllabus and classroom rules and expectations. I explained to the students that they were required to refer to it for any writing-graded or non-graded. Also, I made a poster of it to hang in the classroom and I taped a copy of the list to each desk for continual writing reinforcement. Although it is a integral part of ‘Chapter 2 – The Foundation’ in my teacher resource book, “The House of Comprehension,” I offer it in my TpT store for FREE. The Taboo Words and Phrases list and coordinating lessons are crucial for empowering students to write clear, specific sentences instead of those with meaningless word choices and weak structures. 1. The first day of school, hand out the Taboo Words & Phrases sheet to every student. Explain that they are to refer to it every time that they revise a draft of an essay, an original poem or fiction piece, or a narrative article. Mention that even if they only revise for these particular words and phrases, their writing will dramatically improve. – when they use these weak and clichéd words and phrases, their writing is vague, emotionless, and tells instead of shows. – their writing must show, not tell, and to do this they must use concrete, specific nouns and adjectives. – Verbs form the backbone of writing, and should always show action as well as the emotion of the subject performing the action. 3. Write some sentences on the board that use these weak words and phrases, and have students revise them for strength and clarity. 4. Repeat this information over and over to the students and address it on their final drafts. The other day, a former student who is now a senior in college asked me to send it to her. On my Facebook Profile page she said, “Mrs. C- I am tutoring at CNU’s writing center and have to do a presentation on making writing “concise and precise.” Could you send me a copy of your taboo words list please? It’s been and will continue to be the best advice on writing well that I’ve found ” (Olga S). When this Taboo Words and Phrases list impacts your students’ thinking and writing, it will become a lifelong tool just as it did for Olga.